Video Arte Faenza begins it’s second video art projection for 2019. The projections of video art are composed by video works made by artists from around the world, who work with image in movement as their main technique. Selected works will be organized in projection programmes according to the discourse and conversation between them. • Videos should display the title at the beginning and credits by the end. 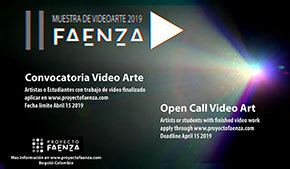 Video Arte Faenza started in the context of Circuito Distrito Artistas Centro (DAC – Artists of Centro District) in Bogotá, where selected works were projected over at the Open Studios days, hosting its first edition in May 18 and 19 of 2018. The open call received more than 70 applications from over 10 different countries, which were projected on 4 programmes: Siénte-lo (feel-it), Abstráe-lo (abstract-it), Juega Local (play local) and Efímero (ephemeral) and hosted the work of established guest artists Miler Lagos and Ricardo Moreno. Projections were displayed at Cinemateca from Universidad Central in Bogotá, at Universidad Católica of Pereira and at Obra Comisionada in Medellín. Video Arte Faenza is organized and produced by members of the artistic group Proyecto Faenza, a team of 18 artists located in Bogotá, looking for inclusion of various forms of expression in contemporary art and presentation of them to the public, aiming to establish a dialogue between the artistic creation and colombian local culture.